The value of a Harvesting - 20 cents 1929 stamp depends on several factors such as quality and wear, supply and demand, rarity, finish and more. Values in the section are based on the market, trends, auctions and recognized books, publications and catalogs. This section also includes information on errors and varieties and characteristics. 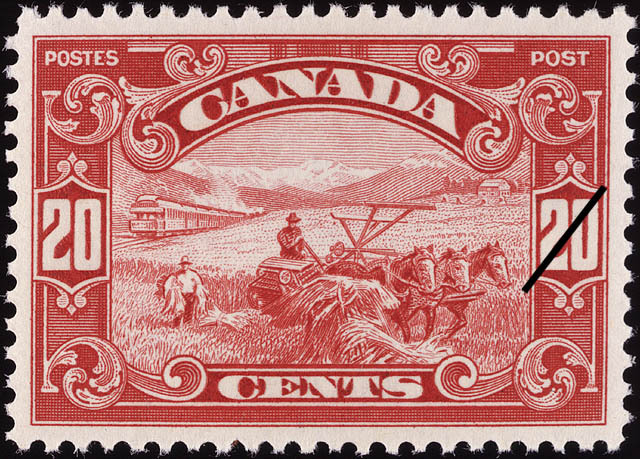 Represented on this stamp, harvesting the wheat crop in Western Canada. The scene shows a western homestead near the foothills of the Rocky Mountains, and horse-drawn equipment typical of grain-growing on a small scale. A transcontinental train, with mountain scenery in the distance, forms the background of the scene. This stamps typifies the agricultural industry of Western Canada.